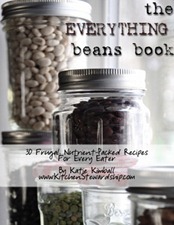 The lovely Katie from Kitchen Stewardship just released her latest e-book called, “The Everything Beans Book: 30 Frugal Nutrient Packed Recipes for Every Eater.” While the book offers 30 different bean recipes, it really offers close to 100 because Katie gives you so many different ideas for ways to change, substitute or adapt the recipe for your dietary needs! Love the way she thinks! If you are interested in learning more and purchasing Katie’s latest book, you can find information over at Kitchen Stewardship. Also, I love her Healthy Snacks to Go ebook as well!